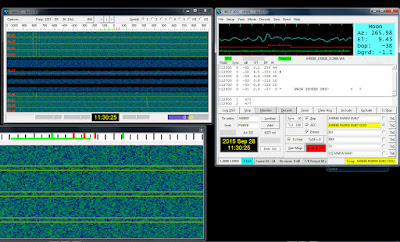 Yuji the first single Yagi 6m EME decode that I've had. He indicated that he was running 500w and a single 8 EL. I run 1.5kw and and a 10EL. Until now the smallest I've decode have been 2 antenna systems. The moon this week has been the best I've seen. After I found Yuji's trace and discovered he was calling I noticed there were 4 min of traces prior. I just wasn't aware that he'd been calling until it was too late. May have completed if I'd noticed sooner. Still this is very encouraging. Moon Set is often much quieter than moon rise here.